People in the U.S. have a three-day weekend coming up thanks to the Memorial Day holiday. Traditionally a time to fire up the BBQ and invite over the family, the holiday is also being marked by special deals offered by HTC. For example, purchase the new HTC 10 and you can take 60% off the HTC Re Camera. With the discount, you'll be able to pick up HTC's action camera for only $79.60. That is a nice sized discount from the usual price of $199. 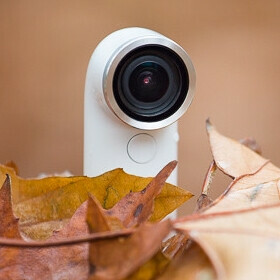 The camera is available in four colors. Also on sale are accessories for your HTC device. For example, the Ice View case for the HTC 10 is marked down to $29.99 from the usual $49.99 price. A dual port charger for the car is cut in price by $10 to $14.99 from $24.99. A Type-C USB cable is $11.99, down from $19.99, and a Universal Car Kit is reduced $20 from $49.99. There are a host of other discounted accessories depending on which HTC model you own. Click on the sourcelink and type in the name of the HTC product you use. The sale has already started and runs to 9pm Pacific Time on Monday, May 30th. I just want to buy Ice View case, but HTC promised to send us a special gift for HTC 10 owners. I wish I could know what is it? Any idea Alan? It's just an extra usb/type-C cable, unfortunately. Yes. People have started receiving them and are discussing it on xda. It's a cable in an unnecessarily large box and a note saying you also get "Uh Oh" protection as a gift (even though we obviously already knew we get "Uh Oh"). I got excited for no reason thinking that this was the 360 cam.